You must have a valid passport to enter Belize, with at least six months before expiration, but visas are not required for citizens of the U.S., Canada, the U.K. and most Caribbean and European Union countries. Entry is granted for up to 30 days, with renewals of up to a total of six months permitted. TIP: You do not automatically get entry for 30 days; the exact period, which may be 7 days or fewer, is up to the immigration officer stamping your passport. He or she usually will ask how long you plan to stay. Just in case you decide to extend your stay, when answering it's best to err on the side of estimating a longer stay. The departure tax is often included in your airline ticket but you should check to make sure if it isn’t since you won’t be able to leave the country without paying the exit fee. Once you’re leaving from the Philip Goldson International Airport (PGIA), the departure fee is USD $35.50 for non-Belizean residents (to be paid in US cash only) and BZD $35.00 for Belizean residents. Additionally, a security fee of US $0.75 is charged for domestic security screening. If you are leaving Belize through the Guatemala or Mexico border, the departure fee is BZD $40.00, which when subdivided, includes BZD $30.00 for a border exit fee, BZD $7.50 for a Protected Areas Conservation Trust (PACT) conservation fee, and BZD $2.50 for a border development fee. However, for travelers that are staying less than 24 hours in Belize (i.e. backpackers traveling from Mexico to Guatemala or vice-versa), they don’t have to pay the BZD $7.50 conservation fee. The border exit and development fees still apply though. or vice-versa), they don’t have to pay the BZD $7.50 conservation fee. The border exit and development fees still apply though. TIP: If you return to Belize in less than 48 hours, your border crossing fee is credited against your departure tax when leaving by air, so save your receipt. Note also that those leaving by land borders usually are charged the US$3.75 conservation fee; this, too, can be credited when you leave by air, so save the receipt and avoid having to pay the fee twice. 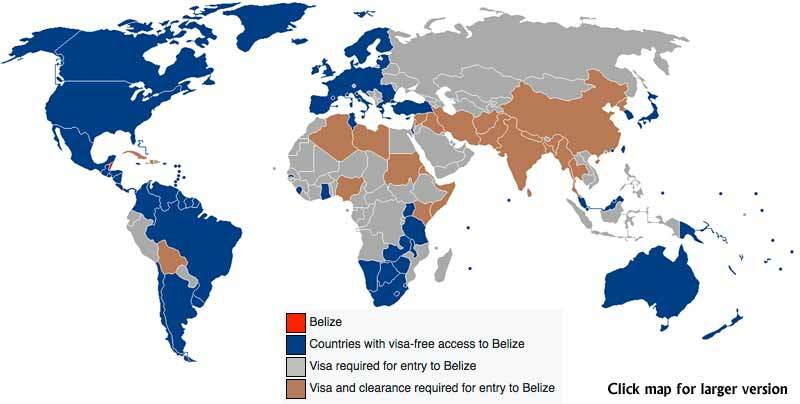 All visitors to Belize, including children, must have a valid passport.. Most visitors, including those from the U.S. and Canada, do not need visas. Entry for international visitors arriving Belize by air is at Philip Goldson International Airport in Ladyville, just north of Belize City. Immigration officials grant stays of up to 30 days, depending on how long you say you expect to stay. To get the longest period, say you plan to stay "about a month." Tourist stays may be extended for up to six months, by paying a small fee, but you will need to visit Belize City and apply for the extension. You will go through customs at the international airport, usually a quick and fairly painless process. If you are flying to San Pedro from the international airport (a 20-minute flight on Maya Island Air or Tropic Air), proceed to the domestic terminals. If you are going into Belize City, either to catch a ferry or to depart from the Municipal Airport, get a taxi at the front of the airport (US$15). Visitors to Belize must possess a passport and a return ticket with sufficient funds to cover their stay. Visitors are given a one-month stay, after which an extension can be applied for with the Immigration Department. For visitors driving/boating into Belize from Guatemala or Mexico, a temporary importation permit must be secured at the point of entry. Vehicle/vessel permits are valid for 30 days. We love kids! Children under 18 years of age must have proper documentation, including a valid passport and letter of parental consent. Children traveling with one parent require a notarized letter of authority from the other parent indicating travel consent. Pets must be accompanied by a veterinary certificate issued by a registered veterinarian from country of origin and an import permit from the Belize Agricultural Health Authority (BAHA) ( telephone number: +011-501-2231653). Holders of passports and refugee travel documents issued by the following 97 jurisdictions do not require a visa to visit Belize. Permanent residents and holders of multiple entry visa of the United States may obtain a visa on arrival for a fee of US$50. Passengers with a valid visa issued by a Schengen Member State (such as Liechtenstein) are visa exempt for a maximum stay of 90 days. If you don’t see your country here please consult with your embassy. Posted : Marty Casado - Thu, Dec 7, 2006 12:01 AM. This article has been viewed 42131 times.